One of my favourite things about living in Manhattan, apart from reading what EB White wrote about it, is that it all happens with or without me. This weekend we stayed in, but the city followed us to our doorstep. The noise, the traffic, the closed playgrounds, the stressed out techies yelling into cell-phones. It could have been annoying. Instead, it felt like we were just here for the big party across the road too. 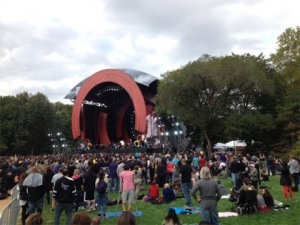 To coincide with the UN General Assembly, the Global Citizen Fund held this year’s free concert on the great lawn on Saturday night. All week we’d watched the equipment, barricades, recording trucks and trailers – full of sound-guys with headphones and lanyards – being parked along Central Park West. My Saturday morning exercise/ mothers’ group in the pine-tum was interrupted, mid-lunge, by a City Parks security officer hurrying us along so they could finish closing off the park. 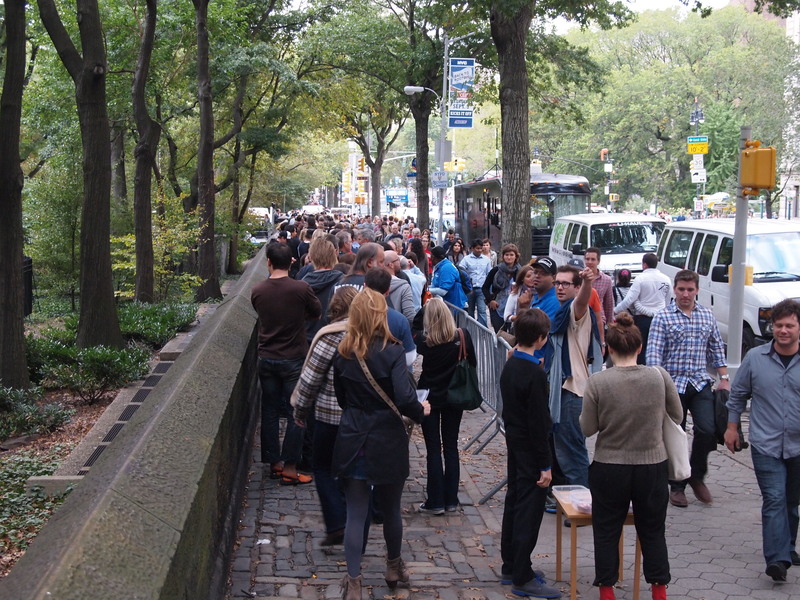 By noon, some of the 60,000 people who earned tickets in the lottery were filtering out of the subway at 81st Street and heading into the park. By 5pm, when I went out foraging for wine and take-away, an intrepid school boy had set up a cake-table by the barricade that funneled crowds onto the Great Lawn. The traffic has been chaotic, car-horns have been working double time and our lovely work out got cut short. But in return, I felt involved. Just by being affected by it, I’ve contributed to this great free event. The Foo Fighters, Neil Young, The Black Keys and K’NAAN should thank me, because I made way! Like most of my feelings about this city, White has already put it so beautifully in his wonderful essay, Here is New York. BAKE SALE! a young entrepreneur sells cupcakes in the concert queue. Aside from my missed squat-jumps, the show passed us by. Like last year’s Black-eyed-peas concert, we heard it second hand as neighbours in near-by brownstone buildings barbecued and sang along on their roof-top decks. We switched on the children’s air-conditioner to drown out the base and drums reverberating down our street and finished watching Homeland with our Mexican take-away. The spectacle may be optional, but it’s nice when it happens on your doorstep. We can be participants by association. “… The gift of privacy and the excitement of participation.” I always suspected it, but never thought of it in just nine words. This is what I love about New York!